The government's convention centre deal with SkyCity has been giving off a bad smell for a long time now. The contents of the deputy auditor general's report on the process were enough for the usually conservative John Armstrong to declare the government's "shonky" selection of Sky City's bid as "verging on banana republic kind of stuff without the bananas." Turns out, it's worse than that. Yesterday's document dump revealed that the Ministry of Economic Development, negotiating last year on the government's behalf, wanted a government veto on the hiring out of the planned conference centre "to avoid having protest groups hiring the NZICC at the same time as a government event." Documents released yesterday reveal how SkyCity and the Government wrangled over what kind of right the Crown would have to block events that it didn’t like from being held at the New Zealand International Convention Centre (NZICC). The final agreement gives the Government a veto right over events at the NZICC that it considers could be “materially prejudicial” to New Zealand’s international relations or national security or the NZICC’s brand, or are simply deemed not to be of a suitable "type and style" for the NZICC. So the government has reserved a right to curb speech it finds inconvenient by making an agreement that allows it to control the use of a commercial facility. Worse, it has achieved that right by trading it against concessions running in favour of Sky City -- concessions it has made on our behalf, and over the concerns of Treasury. The government traded away the public interest in pursuit of a curb on public expression. It's really creepy. When Labour's trainwreck Electoral Finance Bill was lumbering into law in 2007, right-wing commentators were as one in their outrage. 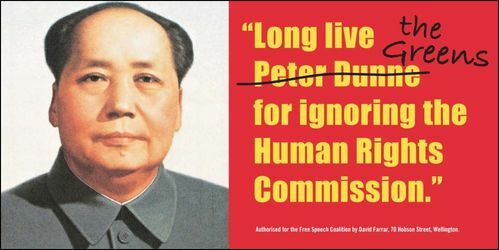 They even formed a "Free Speech Coalition", which gleefully created billboards associating the bill's supporters with genocidal dictators. And today? Just a brief post on Kiwiblog expressing admiration for the government's awesome bargaining skills (a position that's only tenable if you kid yourself about quite how outrageous SkyCity's original demands actually were -- who the hell do these people think they are?). Taken as a part with John Key's dimissive (and deceptive and bullying) swatting away of concerns about the GCSB bill from the Human Rights Commission -- and the Privacy Commsssioner and the Law Society -- this latest insult makes it feel even more as if New Zealand is turning into a different sort of country. And not a good sort. Singapore without the duty of care? Certainly a country that has begun to move away from basic norms of free speech.